mpires since they came out of the closet. If only they could lay low for a bit, and let the mortals calm down. Ethan was staked in the last book. There is a new house master now and memories of Ethan fill every waking part of her life at Cadogan. You can feel her sadness and her determination to carry on without him. Cadogan house is being investigated by the GP to make sure that it is up to snuff. I found this to be a useless part of the book that truly had no place. I know the GP was on everyone’s butts in the last book ,but It felt like it was put in there as a filler. The GP investigator limits blood and junk food for the people living in the house. Again it just felt useless. Nothing ever came to fruition with this storyline besides Merit just getting pissy all the time. The rest of the book was astounding once it picked up. 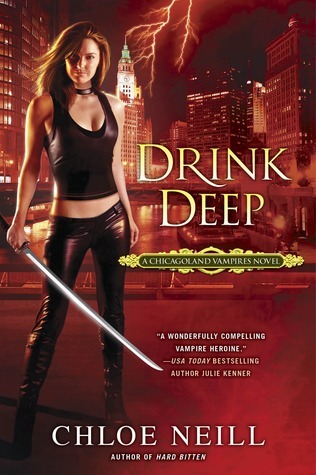 I liked that Chloe Neill delved a little deeper into the supernatural world of Chicago. You feel like you are along for the ride with Merit as revelations persist to crop up on a steady basis. One thing I love about these books is the love for Chicago that Neill portrays. The characters love the city, and the reader in turn loves it too. I cheer at its victories and cringe at its defeats. Chloe Neill weaves this tangible alternate Chicago so beautifully. Merit shows how strong she is and how she is her own person, not just the sentinel of the house. She comes into her own. This book definitely has a few oh my god moments that gave me goosebumps. I can honestly say I was kept guessing to the very last moment—and not to sound cheesy, but I drank every bit of it deep. If you love these books as I do, this is an absolute must read!